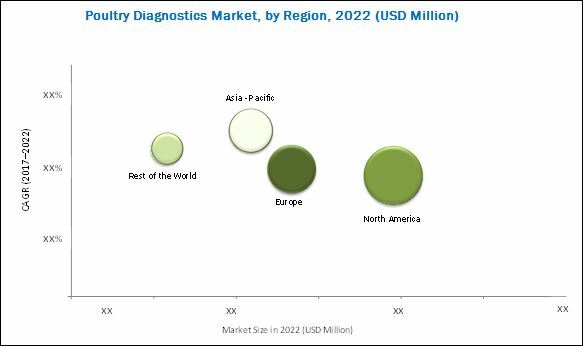 [155 Pages Report] The global poultry diagnostics market is estimated to reach USD 495.3 Million by 2022 from USD 300.6 Million in 2017, at a CAGR of 10.5%. The majority of the demand for testing kits such as ELISA and PCR tests is driven by the increase in disease outbreaks in poultry, rising prevalence of zoonotic diseases, and growing demand for poultry-derived food products. In addition, the diagnostic monitoring of bacterial avian disease on a regular basis in regions like Europe is further driving the overall growth of the market. Emerging regions such as Asia-Pacific offer an added potential due to the large livestock population in this region, growing demand of poultry-derived food products, and increasing awareness about animal health. 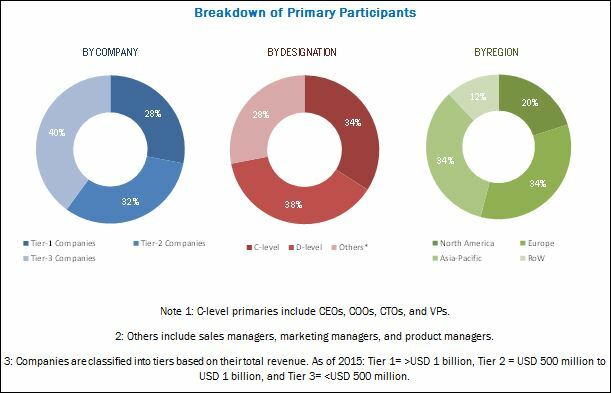 The major players in the market are IDEXX Laboratories, Inc. (U.S.), QIAGEN N.V. (Netherlands), Thermo Fisher Scientific Inc. (U.S.), Zoetis, Inc. (U.S.), GD Animal Health (Netherlands), IDvet (France), AffiniTech, LTD. (U.S.), AgroBioTek Internacional (Honduras), BioNote, Inc. (South Korea), BioChek (Netherlands), Boehringer Ingelheim (Germany), MEGACOR Diagnostik GmbH (Germany), and BioinGentech Biotechnologies, Inc. (Chile). *Top 25 Companies Analyzed for This Studies are - Idexx Laboratories, Inc. (U.S.), Qiagen N.V. (Netherlands), Zoetis, Inc. (U.S.), Thermo Fisher Scientific Inc. (U.S.), GD Animal Health (Netherlands), IDVet (France), Biochek (Netherlands), Affinitech, Ltd. (U.S.), Agrobiotek Internacional (Honduras), Bionote, Inc. (South Korea), Boehringer Ingelheim GmbH (Germany), Bioingentech Biotechnologies, Inc. (Chile), Clementia Biotech (India), Bioneer Corporation (South Korea), DRG Instruments GmbH (Germany), Aquila Diagnostic Systems, Inc. (Canada), Biogal-Galed Laboratories (Israel), Megacor Diagnostik GmbH (Germany), Life Bioscience (Australia), Ubio Biotechnology Systems Pvt. Ltd. (India), Nisseinken Co., Ltd. (Japan).